Cost: Unity 3D’s personal version is free of cost for beginners, students and hobbyists. Unity Personal has all the core features of Unity. It also has core analytics, cloud build, ads, multiplayer, in-app purchases and cross platform features. Other than these features Unity personal has a few limitations too. Two other versions Unity Plus and Unity Pro are also available for serious creators and professionals, starting at the price of $35 per month. 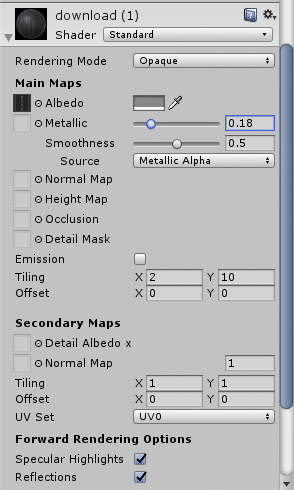 All In-one Editor: Unity is known as an all in one editor. The Unity editor has multiple artist friendly tools for designing impressive experiences. It has a strong suit of developer tools for implementing game logic and high end performing gameplay. Unity also allows you to create both 2D and 3D games. It also includes AI pathfinding tools based on a navigation system. It has an excellent built-in system to create eye catching user interfaces. Its Box2D physics engine allows us to create realistic motion, momentum, force and gameplay. Platforms: Unity supports many different platforms like Linux, IOS, Android, Windows, etc. totally nearly 30 platforms. Virtual and Augmented Reality: Unity supports for virtual and augmented reality development. It is most widely used engine for XR development. It has Microsoft HoloLens, Stream VR/Vive, Gear VR and PlayStation VR support in Unity Plus for virtual and augmented reality. Multiplayer: For real time networked and multiplayer games Unity is the best option. It provides servers for real time collaboration. Engine Performance: Unity’s engine performance is extraordinary. Multi-threaded compute system is coming for intensive scenarios. Unity engine has advanced profiling tools which determines if your game is CPU bound or not and also tells how to optimize it with better experience. Unity Asset Store: It is a massive catalog of free and paid content. You can increase your development time by downloading many built-in free models and assets. Even Unity asset store has complete projects both for free and paid. Graphics Rendering: Unity has one of the best graphics rendering system. It allows you to create environments like luminous day, gaudy glow of neon signs, dimly lit midnights and shadowy tunnels. It produces amazing visual effects. Although Unity supports multi-platform but still it tries to cover low level graphics API of every platform for better results and smother user experience. Team Collaboration: It has features that enable collaboration and simple workflow. Unity’s cloud storage allows you to save, share and sync your projects anywhere. Performance Reporting: Unity performance reporting system deals with issues in real time. High priorities issues are solved very efficiently. Finds application errors across devices and platforms. The Hierarchy window represents every object in the scene. It shows how objects are linked with each other in the scene, so these two windows are related. In hierarchy window there is a drop down list named as Create. You can create an empty object, 3D objects, 2D objects, light, audio, video, particle system and camera objects very easily. The hierarchy window is shown below. ‘Untitled’ is the name of the scene. You can rename it as you want. You can see a drop down icon at the very right side of untitled (scene name). By clicking on this drop down you can see different options for Save Scene and Add New Scene. In scene window you can see another tab labeled Shaded, this is where you can select what type of view you want either shaded or wireframe. It has many other options like Miscellaneous, Global illumination, Real time GI, Baked GI and many others. You can view to 2D or 3D by using the button next to the Shaded drop down. Next is the toggle button for scene lighting. Similarly a toggle button for scene audio. Next is a drop down list to enable sky box, fog, animated material and image effects. 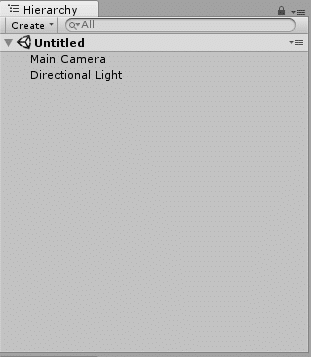 Display 1 shows camera present in your game scene. By default it is set to Display 1 for main camera. If you have multiple cameras and you want to switch then you can select from drop down list. Next to this you can see a drop down for aspect ratios. You can select according to your target device monitor screen. Next you can see a Scale slider to zoom in. Scroll to the right and examine more details of your scene in play mode. Next is the button for Maximize On Play, when clicked, the game window size will be maximum on play mode. Mute Audio toggle is used for mute/unmute audio. Stats shows rendering statistics about your game’s audio and graphics. Left pane shows the hierarchical structure of the project’s assets. When you click on any folder it will show the details in the right panel. For example in the given figure Prefabs folder is clicked in left panel so its details are showing in the right panel as it contains two game objects. In the left panel you can see a Favorites section, where you can drag items which you want to use very frequently to avoid time waste in searching for them. 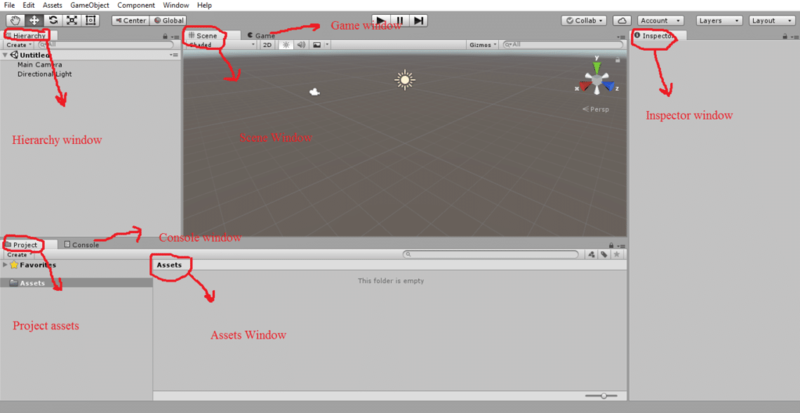 Above it you can see a Create drop down which enables you to create a C# script, a folder, a shader, a GUI skin, a scene, a prefab, a material and much more. The drop down icon at the very top right corner has options for Editor Log and Stack Trace Logging. You can rename your game object by just clicking on the previous name and typing a new one. Next you will see the transform section where you can adjust position, rotation and scaling of your selected game object. In the last you see a button name as Add Component, click on it to add new components to your game object, for example if you want to attach a script, just click on add component and type your script name. 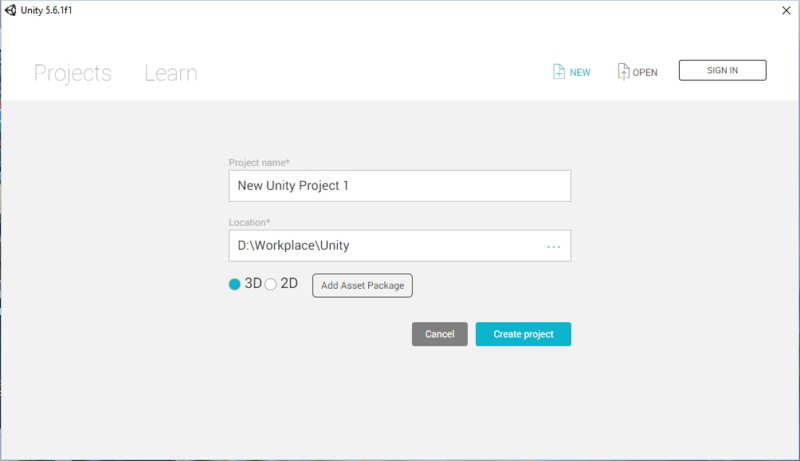 Enter Project Name, select a workplace Location and then select type of your project either 2D or 3D. Click on Create Project. By default you will see an untitled scene containing a main camera and directional light in the scene. Let’s start creating an environment. After applying texture on the ground, click on Ground and set tiling in inspector window. Here is how I set it. Now you have created a road model, let’s create a ball model in unity. Now create a fence or wall around the road. 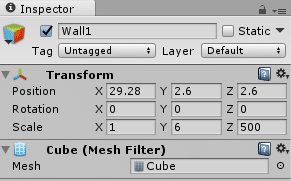 See these transformation values for Wall1. Scale Y to 6 and Z to 500. Then adjust its position so that it comes at the corners of road. We have created wall for one side of the road. Now do the same thing for the other side of the road too. Instead of going through the all the process we can just copy Wall1 and rename it to Wall2. Select Wall1 in hierarchy window and then right click and then select Duplicate option. It will create another game object having same size and transformation values. Click on Wall1(1) and rename it to Wall2. 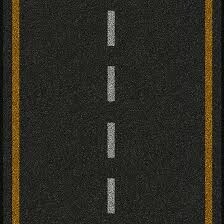 Now adjust position so that it comes to the other corner of the road. 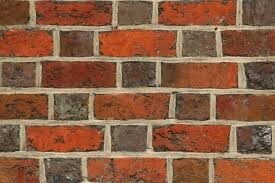 My position values for Wall2 are X to -29.6 Y to 2.6 and Z to 2.6. So we are done with our environment development. Now time to do some coding. For this we have to create a script. Now open the Scripts folder, right click, then go to Create and select C# script. Rename script to Movement. We are creating this script to move and roll the ball on the road. For now the ball is stationary, doing nothing, let’s create some movement in it. You can see two functions Start() and Update(). Start(): Start function is used for initializing variables and objects. It is called only once when the script is enabled just before any other update function calls. Update(): It is a mono behavior function, it is called once in every frame. Other than these two there are many other mono behavior functions for example awake(), fixedUpdate(), lateUpdate() etc. To move the ball on the road first of all you have to make it a rigid body (it is an ideal solid body in which deformation is neglected). Select Ball in hierarchy window and click on Add Component button in inspector window. Type rigid body and press Enter. A rigid body will attach to the Ball. Now go to script and create a private variable of type Rigidbody. Now assign rigid body of the Ball to this variable you just created in the script. Now write some code for the movement of this rigid body. What’s the idea? Ball should move when I press arrow keys of the key board. It should move forward when up key is pressed, backward when down key is pressed and so on. Now create a Vector3 variable to get movement values. As speed is a public variable so you can assign value in the inspector window. Attach this script to the ball by dragging it to the inspector window or by pressing Add Component button. Press play button and test your coding either ball is moving or not. Last thing you will notice is when you press forward button and ball starts moving it goes out of the camera as camera is stationary. What should we do? We should move camera too? Yes it is the simplest thing to do. Make the camera child of the ball by dragging main camera to the ball. This was a basic introductory tutorial in which you learned many interesting features, environment building and scripting in Unity. Don’t hesitate, start creating your first game with Unity today and enjoy!